It appears that Russia has successfully managed to confuse everyone with its new missile development programs - the names that are in the news are Rubezh, Avangard, Yars-M, with designations like RS-26 or KY-26 making occasional appearance. And that is without taking into account the new liquid-fuel ICBM (Sarmat?) development program. That was probably intentional, but luckily, the Russian blogosphere is a great crowdsourcing machine that often produces extremely valuable bits of information and dissects them quite effectively. The picture that emerges is still far from complete, but there are a few interesting observations that could be made at this point. Below is my attempt to make sense of the information that has been available so far - I hope it will provoke further discussion and help clarify the picture a bit. The starting point of the discussion is the four flight tests of what has always been described as a new intercontinental ballistic missile - two tests from Plesetsk (a failed test in September 2011 and a successful one in May 2012) to Kura and two from Kapustin Yar to Sary-Shagan (in October 2012 and in June 2013). All these missiles were clearly solid-propellant missiles launched from a mobile launcher. From the official statements that described these tests (which should be taken with some caution), it appears that the May 2012 and October 2012 tests (and probably the failed one in September 2011) involved a single warhead, while the June 2013 missile carried multiple reentry vehicles (it was described as a "new combat payload"). Reports from the tests also indicate that the missile is being developed by the Moscow Institute of Thermal Technology (MITT). Speaking after the June 2013 test, the head of the Main Operational Directorate of the General Staff, Gen.-Col. Zarudnitskiy revealed that all these four launches were part of the series of tests of a Rubezh missile complex with "a new intercontinental-range ballistic missile with improved accuracy." According to Zarudnitsky, one more flight test will take place in 2013, so the Rocket Forces will receive the first Rubezh regiment in 2014. There is little information about the Rubezh missile itself, although there are some bits and pieces here and there. There is a December 2012 statement by Sergei Karakayev, the commander of the Strategic Rocket Forces, who referred to the flight tests conducted to that date as part of the program that will develop an ICBM that will replace Yars and Topol-M in the future. This suggests that he was talking about Rubezh and that the system includes a missile that is comparable to Topol-M or Yars. Some unofficial, but reasonably reliable statements describe a new mobile launcher and a missile that are substantially different from Topol-M/Yars. This system appears to be Rubezh - the name was not mentioned, but the system was said to undergoing flight-testing, so it is reasonable to assume that it was Rubezh. This missile system was reportedly shown to the United States as part of the New START notification process some time in the fall of 2012. There are also a few statements that could not be directly linked to the Rubezh flight tests and that leave some room for interpretation. Before Zarudnitsky's statement, it was offen assumed that the new missile that was flight tested in 2011-2013 is called Avangard - the name that was mentioned by the Russian defense minister in July 2011 - he said that "acquisition of strategic missiles Topol-M, Yars, and Avangard will increase threefold." Name "Avangard-R" was mentioned as well, leading some to conclude that Avangard and Rubezh might be the same system (e.g. Rubezh missile system with Avangard missile). However, the evidence linking Avangard to the four flight tests (and therefore to Rubezh) is quite thin, so I would be cautious about suggesting that this is the same missile. Another designation that appeared in the news is Yars-M - it was mentioned by the former Chief of Main Staff of the Rocket Forces, Gen.-Col. (ret.) Victor Yesin, who said that combined tests of the the missile will begin in 2014. A few days later Sergei Karakayev was asked directly if the Rocket Forces will receive Yars-M by the end of 2013 - he seemed to confirm it, but there is a chance that it was a misunderstanding. The name Yars-M suggests that it is fairly close to Topol-M/Yars, so it is unlikely to be dramatically different from them, as Rubezh was reported to be. So, I think it is safe to conclude that Yars-M is not Rubezh, but rather a regular upgrade of Yars. Then, there is a "medium-class" ICBM without a name - in December 2011 Sergei Karakayev mentioned a new "medium-class" solid-propellant missile "with a new type of combat payload." He used virtually the same language as one year later to talk about what appears to be Rubezh, so there is a good chance that Rubezh is indeed the new "medium-class" missile. All this seems to suggest that Rubezh is a fairly substantial, but not particularly revolutionary upgrade of the missiles of the Topol-M/Yars line. It may be known as Avangard, but it's possible that Avangard is something else - it might be, for example, Yars-M. In fact, my guess is that it is more likely that Avangard and Yars-M are the same. But this is not where the story ends. A couple of recent developments suggest that the Rubezh missile might be something totally different. First, Washington Times reported that some in the U.S. intelligence community believe that Russia may be violating the INF treaty. The report quotes one official as saying that Russia is developing "an intermediate-range missile that [the Russians] have classified as an ICBM because it would violate the INF treaty." This statement appears to refer to Rubezh (although it is identified in the report as Yars-M, which is probably incorrect, or RS-26; KY-26 appeared in a version of that report) and the fact that it was tested twice from Kapustin Yar to Sary-Shagan, at a distance of about 2,000 km, was presented as a confirmation of the fact that it is not an intercontinental missile. On its own, a flight test from Kapustin Yar to Sary-Shagan would not mean very much. Russia has been testing ICBMs (like SS-25 Topol) along this path quite regularly and no one would argue that these tests violate the INF treaty. We know that Rubezh was tested at the range of about 5,800 km - from Plesetsk to Kura - which definitely qualifies it as an ICBM under the terms of both the New START and the INF treaties. Also, Russia did declare that the new missile is an ICBM - Washington Times quoted General Yesin as saying that the notification was made in August 2011 (i.e. before the first flight test in September 2011). In all official public statements Rubezh referred to as an ICBM. So, technically, there is no violation - neither the INF Treaty nor New START prohibits testing ICBMs at a shorter range. At the same time, I think we can assume that the U.S. intelligence community is fully aware of the intricacies of arms control treaties, so it has to be something else that allowed the unnamed official to say that Russia may be violating the INF treaty. One possible explanation was discovered on July 3rd, when a certain vehicle, described as MZKT-27291, was shown at the Independence Day parade in Minsk, Belarus. The story of MZKT-27291 is that it was described earlier as a TEL platform for one of the future road mobile missile system developed at MITT. The work was reported to begin at some point in 2008. We don't know if this new missile system is Rubezh, but if it is, then a few pieces seem to fall into place. 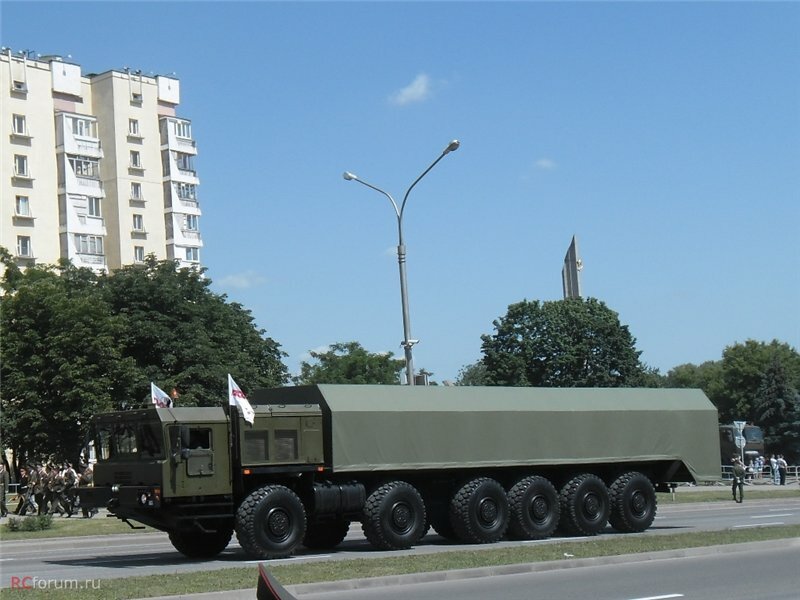 Being a six-axle transport, MZKT-27291 is clearly too small to carry a missile of the size of the Topol-M/Yars, let alone a bigger one - these missiles weigh about 47 tonnes and have launch containers that are more than 22 m long, so their TELs have eight axles. If this is a Rubezh launcher platform, the missile should be much smaller. Now, if we return to reports about Rubezh flight tests, some of them did describe a missile that is smaller than Topol-M/Yars - Vedomosti reported that the missile is fairly small, Kommersant quoted its sources as saying that the missile is similar to Bulava, with the weight of about 36 tonnes and the length of about 12 meters. This would be a kind of missile that might fit on a six-axle TEL. Also, this would be a missile and TEL that are "substantially different" from Topol-M/Yars, just as some reports suggest. If we assume for a moment that the TEL shown in Minsk is indeed the Rubezh launcher, it might explain the INF violation accusations. Although the missile is legally indeed an ICBM, it may well be that the demonstrated range of 5,800 km is close to the maximum range of the missile. Also, if it is indeed the case that in the Plesetsk-Kura test the missile was flown with a single warhead, it is possible that it would not be able to demonstrate an ICBM range with multiple warheads. This would probably place Rubezh in a grey zone, as the New START definition of range does not say anything about payload. It is also worth noting that the U.S. administration officials were careful in responding to questions about potential INF violation - while confirming that ICBM tests are not subject to INF Treaty restriction, they said that more information will be provided in the forthcoming Annual Compliance Report. There are, of course, some pieces that don't quite fit, leaving more questions than answers. One is Karakayev's description of Rubezh as a "medium-class" ICBM that could replace Topol-M and Yars. Although "medium-class" is not a well-defined concept, it is unlikely that it would be applied to a missile that is lighter than SS-25 Topol. Another is the insanity of the idea of using an ICBM as a shorter-range missile - why would Russia use up its New START quota of strategic launchers to deploy non-strategic missiles? Also, it is not quite clear how reliable is the information about the link between MZKT-27291 and Rubezh. So, is Rubezh a "medium-class" missile that is somewhat bigger than Topol-M/Yars? Or is it a small missile that barely qualifies as an ICBM? As it often happens, the bottom line is that we don't seem have enough information to make a definitive conclusion one way or another. Things increasingly point in the direction of a small missile, but there is no hard evidence that would suggest that this is the case. Thank you for trying to bring order into the chaos. Is there any sense in all these projects other than keeping design bureaus busy? It must be just a logistical nightmare for the RVSN to deal with all these different missile systems. Different sets of training, maintenance, spare parts, contractors, whatever... Is the leadership of the RVSN in favor of this, or do they have to take whatever MITT&Co come up with? Not only the ABM Treaty but also the INF Treaty became obsolete. Other Nations like China, India, Israel and in the future maybe Iran and North Korea are free of this limitations. And there is a certain export market (Saudi Arabia) too. So from the military aspect there is something missing in between SS-26 and SS-27. If there are in the future some ABM Systems in Europe what threat could Russia present? Just to repeat the statement to deploy SS-26 at Kaliningrad? Russian Generals always missed the good old days of SS-20 and Skorost. A 5800km ICBM which is able to reach out to 4500km with a more complex warhead system would be a perfect match. Of course these launchers would count as ICBM but to have them in a well mixed arsenal is not a bad solution to cover all different threats of the future. Not only in Europe but also in respect to the middle east and asia. I think Russia will not step appart when China is pushing its DF-21C/D and even more capable systems because - other than the US - they have some potentially threats just in front of the door. Is there any possibility that Rubezh - meaning by this name what fits inside the six-axle vehicle - is a modernized version of the RSS-40 Kuryer? So, indeed the “improved” RS-24 Yars (perhaps named Yars-M and/or Avangard?) may well be a different missile entirely from the new Rubezh. The plot thickens. I still think that evidence still points to Rubezh and Avangard being the same thing (different code names for different parts of the missile system, which is in line with Soviet/Russian design nomenclature). The Yars-M name and the idea that the new missile is a minor RS-24 Yars upgrade seems to come from tertiary sources like Yesin, whom I simply do not trust to have reliable up-to-date information. What Rubezh/Avangard is or isn't is frankly up in the air so far. I see absolutely no credible evidence that would reliably link that 12x12 chassis with new missile. With that in view, I would personally abstain from making any far-reaching conclusions about Rubezh. artjomh: Do we have an example of different names for a missile system and the missile itself? I don't know of any. So, Rubezh and Avangard are probably different systems. Yars-M seems to be a designation invented by Yesin, who probably couldn't tell the real name of the system. It could mean anything really. On the 12x12 TEL, I agree, there is no reliable link to Rubezh. But there is circumstantial evidence supporting it - reports describing Rubezh as a small missile in Kommersant and Vedomosti, and the INF business. I agree - it's still not enough to make definitive conclusions, but it's something. And I thought that I didn't make any, did I?. The missile already exists, only the launch equipment has to be developed, and it fits in what is alleged to be its TEL. Its range should be 8000 / 9000 km with 6 warheads just like Bulava, so no question about being an ICBM. Nitpicking detail, the 12x12 vehicle is designated MZKT-79291. If they want to, the Russians are good at deception. It is possible that the "road mobile missile" associated with the MZKT-79291 is something else, like a mobile ABM or ASAT missile, but it would be in their interest to make the world believe otherwise. Pavel, off the top of my head, the Moscow ABM system is codenamed Amur, the upgrade to it is codenamed Samolet-M and the upgrades to the interceptor warheads are codenamed Kopye-2M, Pika-M and Molniya. Topol-M ICBM project was developed under the codename Universal. Iskander SRBM was developed under codename Iskander, but the chassis for it were developed under codenames Faset and Voschina-1. artjomh: I'm not sure these would qualify. We are looking for an example of a missile system and a missile in that system having different names. But I would agree - it's not impossible for Rubezh and Avangard to be the same thing. A bit unlikely, though. Could this new ICBM just be a land version of Bulava SLBM , Solmonov did hint about Bulava land based capability in one of the interview atleast he sounded keen to have one. Bulava is lighter at 36 T and is also a shorter and stubbier ( 2m dia ) missile with full ICBM range , Solmonov hinted that its range is similar to Sineva. It might be that the warhead is of the new type tested in 2010 and the missile are the same with identical throw up weight. Although I feel if such a conversion did take place then they can make it more lighter as the land version does not have to deal with pressure of depth/submerged launch and they can opt of lighter materials for casing giving it an advantage in range or throw up weight. Well, Pavel, we don't really know what particular component the "Rubezh" and "Avangard" names refer to, so there is little point in arguing now, since neither of us knows the facts. That being said, I think you'll agree with me that there is evidence of projects getting renamed (or cancelled and started under a different code name) and different components being developed under different project/theme names (sometimes) and under different GABTU and GRAU indices (almost always). What some of our Western colleagues need to keep in mind while discussing this topic of weapon nomenclature is that proper names for weapon system are a largely post-Soviet invention. Missiles and submarines and aircraft in USSR had industry and military designations, but they weren't referred to in general discussion by official names like "Titan" or "Atlas" were in US. Proper names for missiles is largely a post-Soviet marketing retcon where these designations were lifted off of obscure R&D projects or off of Soviet diplomatic trickery (as was the case with submarine class "names"). These days, names for weapons are a pure branding gimmick. They named an IFV "Terminator"... You can't get any more marketing-speak than that! And… where is the evidence linking the MZKT-79291 with the ‘new and short’ ICBM? Nowhere. By the way, the tractor could be perfectly linked to the ‘exo-atmospheric and ASAT’ interceptor of the S-500 system. Official statements tend to suggest that Avangard/ Rubezh is a further evolution of the Topol-M – Yars dynasty with a slightly modified solid fuel and a new payload. And this will not fir in those TEL. In the end the ‘evidence of the violation of the INF treaty’ is null. Terminator isn't an IFV, it's a direct-fire support vehicle on a tank chassis. It started out as a Soviet project to develop a whole new class of vehicles, one they called the BMPT (not to be confused with BMP-T which like BTR-T simply refers to a heavy IFV). It has no troop transport capacity, and is nothing like other Soviet or western IFVs. Alexander: So, Yesin seems to confirm that there is a "medium-class" missile that is an upgrade of Topol-M/Yars. But I would say it is still a bit circumstantial. Thank you for the link to the insurers. I assume that RS-26 is this "medium-class" missile. Is it? The story says it was Topol, not Topol-M. I personally didn't hear that Yesin spoke about the SS-26. But I read the WP. There Yesin said that "the RS-26 ballistic missile, which is a Topol class ICBM, is not covered by the INF Treaty as its range is over 5,500 kilometers. Russia officially informed the U.S. about that in August 2011". I think I've heard the insurance story before. Probably without RS-26. Here RS-26 is called Rubezh - http://www.rg.ru/2013/10/03/rubez-anons.html - but it's not clear how credible it is. I think that the truth in one. And I trust the general Yesin: "Russia officially informed the U.S. about that in August 2011". The treaty says that these are the data that the U.S. cannot disclose without explicit Russia's consent. So, I guess we won't see them.